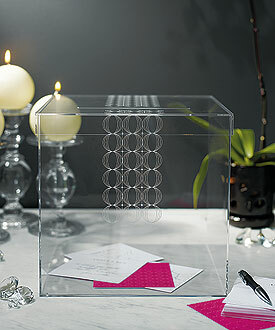 This contemporary acrylic box creates a sophisticated Wishing Well that will work with any color theme and coordinating personalized note cards are the perfect complement. It can be used as a Well for guests' wedding cards or as a memory box for all your wedding keepsakes. Note: Personalized Well Wishing Cards sold separately.